uuid : fb4f9300-fa94-41c8-8016-095b3717f785 templates_id: 119552 templates_uuid: "a472fc51-6c71-4bc3-80a3-870d2b1163af" title: "Opt Out of the Working Time Directive- Working Time Regulations Opt Out" display_name: "Working time directive opt out letter" meta_keywords: "Individual agreement to opt out " description: "
Protect yourself when you want to disapply the 48 hour limit on average weekly working time for employees based in England and Wales, using this working time directive opt out letter. This letter of agreement complies with the Working Time Regulations 1998 and contains everything to make sure you observe the law, including the agreement to opt out, mandatory rights for the worker to withdraw from the agreement. What is a working time directive opt-out letter? A Working time directive opt-out letter is a letter by which an employer and an employee agree on opting out from the statutory maximum weekly working hours that apply to employees. It sets out the agreed working pattern and outlines the employee\'s right to withdraw from the agreement. Why do I need a working time directive opt-out letter? An opt-out letter allows you to disapply the statutory 48 hours limit on weekly working time, while remaining in compliance with the law. What are the conditions to opt-out from the Working Time Directive? Employees can opt-out from the directive as long as it is mutually agreed in writing with the employer. Can the employee withdraw from the opt-out agreement? Employees can withdraw from the opt-out agreement whenever they like - even if the opt-out provision is part of their employment contract. To do so, the employee must give at least 7 days written notice. A longer notice period may be agreed with the employer, but it can be no longer than 3 months. Can the employee refuse to sign the opt-out letter sent by the employer? Yes - opting out must be voluntary and the employer cannot force employees to agree on it. What are the consequences of an opt-out letter on hours of work? When opting out, the employee agrees that their average weekly working time may exceed 48 hours a week. How long should the opt-out agreement last for? The length of the opt-out agreement is decided by the parties. They can opt-out for a certain period or indefinitely. This letter of agreement to disapply the limit on average weekly working time complies with the Working Time Regulations 1998.
" created_timestamp: "2018-10-08 04:36:53.0" modified_timestamp: "2018-10-08 04:36:53.0" active: true created_by: 236 modified_by: 236 dcm_id: 230 url_slug: "Working-time-opt-out-letter-agreement" meta_description: "Prepare a working time directive opt out letter agreement with help from Rocket Lawyer. Protect yourself when you want to disapply the 48 hour limit on average weekly working time for employees based in England and Wales. Try this opt out agreement." time_to_complete: "10 minutes" role1: "Employer" role2: "Worker"
A Working time directive opt-out letter is a letter by which an employer and an employee agree on opting out from the statutory maximum weekly working hours that apply to employees. It sets out the agreed working pattern and outlines the employee's right to withdraw from the agreement. More than just a Working time directive opt out letter template, our step-by-step interview and guidance makes it easy to create your document. 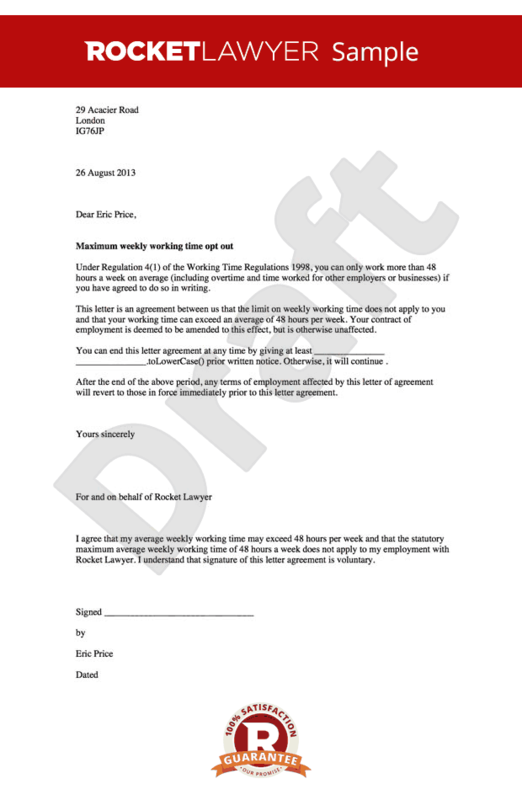 Easily create online, download, print and sign your free Working time directive opt out letter in minutes. This document is also sometimes called: Individual agreement to opt out .